To purchase tickets, visit telecharge.com or by calling 212.239.6200. Jake Gyllenhaal and Ruth Wilson in Constellations. Photo by Joan Marcus. 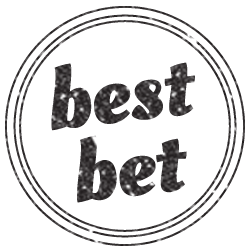 BOTTOM LINE: This unusual plays consists of short scenes that explore the different possible outcomes of one relationship. The strong performances from the actors help to make this an enthralling production. Constellations is the last type of play you would expect to find on Broadway, the frequent destination for flashy musicals filled with elaborate sets and costumes designed to attract tourists. In stark contrast to many of the shows currently playing, Constellations is devoid of any kind of set or prop aside from light up white balloons that fill the ceiling and both sides of the stage. The only glitziness that might attract less theatrically inclined tourists is the inclusion of known names Ruth Wilson (a London theater veteran making her Broadway debut and who is now known in America after her Golden Globe win for The Affair) and film actor Jake Gyllenhaal, also making his Broadway debut, whose theater experience is limited but who worked with Nick Payne previously in an Off-Broadway production of If There Is I Haven't Found it Yet). The show begins when Marianne (Ruth Wilson), a quantum physicist, spots Roland (Jake Gyllenhaal), a humble beekeeper, at a mutual friend’s barbecue. Marianne tries to pick up Roland rather clumsily with a silly segue about the impossibility of licking one’s elbow. The scene restarts over and over again as we see Marianne use different variants of her pickup line. Roland shakes off Marianne’s friendliness, feigning the presence of a girlfriend, a wife, and the still fresh wounds of a recent breakup, until finally in one variant of the scene Marianne utters her lines just gracefully enough for Roland to be receptive. This set up shows just how much chance and how many variables are present in whether or not a potential romantic partner will reciprocate, bringing to mind David Ives’ It’s All in the Timing. The concept stringing together the play’s differing scenes , however, is about much more than just chance and timing. Marianne’s profession as a physicist leads her to connecting the outcomes of their relationship and their lives to string theory and the idea of the Quantum Multiverse. “We’re part of a multiverse, at any given moment, several outcomes can coexist simultaneously... In the quantum multiverse every choice you’ve ever and never made exist in an unimaginably vast universe of parallel universes,” Marianne explains. As the play moves forward we see many possible futures for Roland and Marianne unfold. In one scene their relationship is torn apart when Roland cheats on Marianne, and in the next scene the relationship is torn apart when the reverse situation occurs. In another series of scenes we watch Roland maladroitly propose to Marianne over and over again until finally in one universe his proposal is happily accepted. In other scenes the two are pulled apart and reunited or reunited only to discover that Marianne has cancer. Through these scenes we see the many possible tragedies and joys that can lie ahead for the two lovers. By creating one show out of many differing scenes one can see the many potential pitfalls and outcomes that can steer two people away from a happy ending or from making a solid connection. This feeling of fragmentation however, leaves less room for development in regards to characters and narrative. 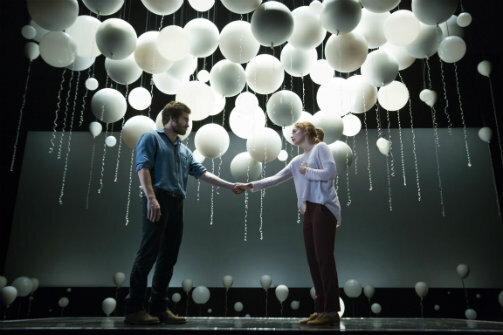 At just 70 minutes long, with such a minimalist set, Constellations certainly seems to be a much smaller offering than most Broadway theatergoers are used to. (Audience members expecting all the bells and whistles of a Broadway show may feel they are not getting their money's worth.) However, this show never feels too small or too insignificant. Part of this is due to the heavy hitting concepts guiding these scenes, the other is the sheer force of the actors in this production. Gyllenhaal and Wilson give intense, natural feeling performances in which the significance of each seemingly small twist is amplified. Together the two have a strong chemistry that makes each of their motions in sync with the other's and their emotions play off of each other well. The believability of the couple is partly what makes each of the play's differing outcomes so touching, whereas in lesser hands the sadder moments might have come across as sappy. The lighting used within the production (designed by Lee Curran) serves to augment and guide the audience in regards to the emotional state of each scene as it unfolds. Despite the simple and romantic subject matter of boy meets girl at this play's core, there’s a chilling eeriness that runs through the play. As the balloons light up, seemingly representing the different planets with different possible lives, and the actors stand on the stark blackness of the stage, one cannot help but wonder what different possible lives we have abandoned due to the choices and actions we have made and the randomness of the events that comprise our lives. You can only hope that through the cold randomness of our universe we can still find a connection. The emotions stirred by this powerful production will last long after the actors have taken their bows.